Looking for the best neighborhoods in Charlotte for you? This guide will get you acquainted with some of Charlotte's top neighborhoods so you can make an informed decision about where you'd like to live. When you’re hoping that your move will go smoothly, often, the first step is to figure out which neighborhood you should narrow your apartment search to. Here’s our breakdown of the best Charlotte neighborhoods and what they have to offer to a newcomer. Don’t only look at a map; get a feel for the top places to live with this guide. If you're short on time, we'll list the top neighborhoods in Charlotte up here (in no particular order) — and well go into more detail below! Read on for more details on each neighborhood! With Fortune 500 companies packed into a tight business district that’s also referred to as "the loop," this is one of the best neighborhoods in Charlotte, NC, for those who want to be close to where they work (as well as close to the nightlife scene). Unfortunately, it’s also the most expensive; in 2015, it was quoted as having the highest average rent in the city at $1,712 per month. Condos, townhouses, and upscale lofts can be found here. Here's a map of the Center City neighborhood. And here's a "street-level" view of Center City to give you a closer look. This neighborhood is also called the Arts District of the city, with murals, bars, live music, and taco trucks. This is the favorite for young professionals and twenty-somethings looking to enjoy living in converted mills and snazzy lofts. The colorful, revitalized area is now a very walkable downtown mix of small businesses and art galleries and wants to welcome you with open arms. If you’re thinking about moving to this bohemian-chic neighborhood, why not join in on one of their monthly gallery crawls? Here's a map of the NoDa neighborhood. And here's a "street-level" view of NoDa to give you a closer look. A more mature, classic area full of stately buildings mixed with cozy bungalows, this stylish neighborhood is also listed on the National Register of Historic Places. It borders the perfect place to run: Freedom Park. This is also one of the best Charlotte neighborhoods for easy access to public transportation in an otherwise very car-dependent community. Commute easily toward Uptown via the LYNX Blue Line. Here's a map of the Dilworth neighborhood. And here's a "street-level" view of Dilworth to give you a closer look. A far more ethnically diverse choice than anywhere else in this Charlotte neighborhood guide, the Plaza-Midwood area mixes golf and tattoo parlors, fine breads and Asian cuisine, used LP shops and converted mansions. This is a mid-gentrification 1920s streetcar suburb that’s hip without being weird about it. Urbanites from cities like New York will often prefer Midwood because of its city feel, which is strangely rare in this city. Here's a map of the Plaza-Midwood neighborhood. And here's a "street-level" view of Plaza-Midwood to give you a closer look. The obvious home of the University of North Carolina at Charlotte, UNCC is not the only positive attribute to this neighborhood. Now, you can visit loads of shops and restaurants around the edges. Here's a map of the University City neighborhood. And here's a "street-level" view of University City to give you a closer look. Home of the huge shopping mall that carries its name, SouthPark is the secondary business district outside of Center City. You’ll find million-dollar homes mixed with affordable condos. Here's a map of the SouthPark neighborhood. And here's a "street-level" view of SouthPark to give you a closer look. Not to be confused with SouthPark, South End is a relaxed version of both Dilworth and NoDa. It has great live music and a chilled-out feel. Full of old mills and factories, the area was revitalized in the 1990s and now is home to a slew of businesses, from galleries to pet stores to fashion boutiques. Here's a map of the South End neighborhood. And here's a "street-level" view of South End to give you a closer look. Developed only about a decade ago, this picture-perfect suburb has homes and rentals of all different price ranges. When you’re looking for something new, clean, and simple, this is the best neighborhood in Charlotte, NC, for you and your family. Here's a map of the Ballantyne neighborhood. And here's a "street-level" view of Ballantyne to give you a closer look. This is an affluent, historic centerpiece of the city made famous by its grand homes and willow oaks. It’s also one of the more expensive places to live in the city, with rent averaging $1,579 every month, and where "old money" likes to flock to. Be sure to stop by Theatre Charlotte. Of course, there are other neighborhoods that have drawn in crowds and fans, but these are our picks for some of the best neighborhoods in Charlotte, NC. With so much to offer, it really depends on what you’re looking for when trying to determine which of the neighborhoods will be best. Charlotte, NC, neighborhoods also go beyond the city’s borders; check out some of the great suburbs in the area like Concord and Fort Mill when looking for a good listing online. Here's a map of the Myers Park neighborhood. And here's a "street-level" view of Myers Park to give you a closer look. 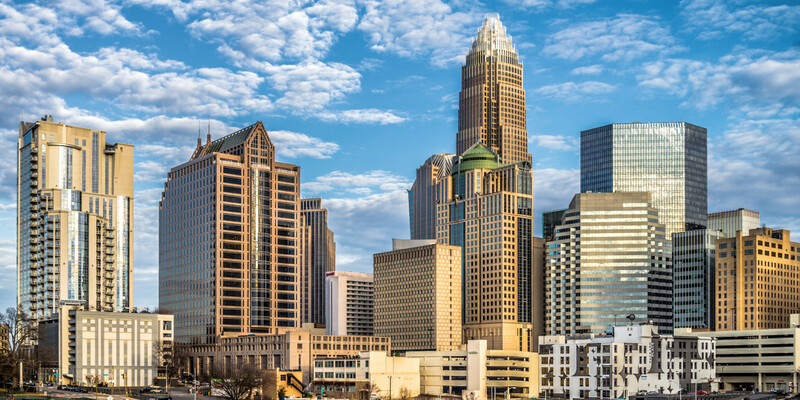 Here are our top tips for moving to Charlotte, North Carolina, including finding where to live, when to move, and how to get acclimated as a local quickly.